Before the January 12 earthquake, widely available maps of the country of Haiti had little more than a few highways and roads. The capital city of Port-au-Prince was a shaded outline that suggested a city. The problem was that Haiti, the poorest country in the western hemisphere, had been ignored by traditional commercial data providers. Few could afford a GPS, so why build digital maps of roads or buildings? When the earthquake struck and crisis responders began planning their aid, they were left without a means to identify cities, routes of entry, buildings, parks, or much of anything that would allow them to know how to possibly provide support to the citizens of Haiti. Immediately volunteers began scouring for available maps and road data. Historic maps, unclassified and released from the CIA, served as the first options for understanding what infrastructure existed. The New York Public Library was working on a way to scan and position historic maps accurately on the Earth. The NYPL Map Warper was released early and special section was setup and volunteers began digitizing these maps. Another resource, the OpenStreetMap project, had more data that was created the previous hurricane season where people around the world drew roads and buildings. Incomplete at the time, the newly scanned historic map provided and additional source of information in which to continue digitizing roads, bridges, cities, and hospitals. Fortunately, due to invocation of the Space Charter by France, UN gathered satellite imagery was released to the public. In addition, the major satellite imagery providers GeoEye and Digital Globe released their updated imagery over Haiti and approved their licenses to allow volunteers to trace over the imagery into the OpenStreetMap project. The result of all this data was that a largely empty and incomplete map gathered thousands of volunteers, developers, and organizers to generate was is currently the most complete map of the country of Haiti. 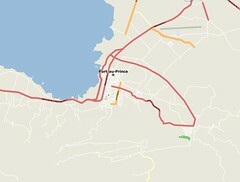 The city of Port-au-Prince has been largely mapped and volunteers are now working on outlying cities and villages. Beyond just marking roads and transit information, there was analysis of damaged buildings, displacement camps, and triage centers. The map serves more than merely a digital, web based map for viewing the decimated region. The data gathered is free and open to use by anyone. Reporting projects such as Ushahidi can provide accurate road information for citizens calling for aid. Response organizations and government agencies are using OpenStreetMap for print maps to hand out in the field, and also deploying to mobile GPS units. And the data will only get better, providing as a resource for the long-term recovery efforts, and rebuilding. Haiti need never again be an empty spot on the map. This article was originally posted at crisiscommons.org/Haiti-Open-Street-Map. An interesting side-note would be the work Ushahidi does with "crisis mapping" allowing people in Haiti and elsewhere to add information relating to where emergency personnel are, where emergencies or threats are occurring, etc. 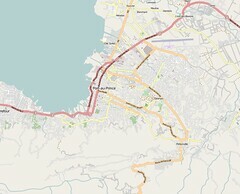 That's FANTASTIC, OpenStreetMap & Free Software ! I'm speechless !